How has the Women’s Fund helped A Moment’s Peace? 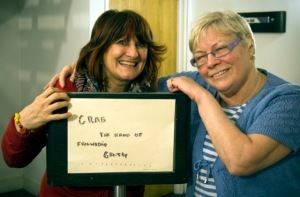 The grant received from the Women’s Fund contributed to ‘Standing Strong’, a project which aimed to work with a diverse range of women to explore how their individual experiences of struggle and survival brought them to where they are now. To do this the group used the work of seminal female artists; Tracey Emin, Gillian Wearing and Carol Ann Duffy, who often work in relation to autobiography and/or political themes and whose work is often considered provocative. The aimed outcome was to enhance creative skills, build individual confidence, encourage self-expression and have an impact upon the participant’s engagement in their personal and professional lives. The women who took part in this project live all across Glasgow, aged from early twenties to seventy years old. They represented a wide cross-section of the community in terms of employment and geographical spread. Most of the women in the group had experienced domestic abuse, poverty, deprivation, unemployment, mental ill-health and addiction. The project culminated with a presentation of the women’s work at the Centre of Contemporary Arts in Glasgow and was shared with an invited audience. The presentation included photography, craft work and the presentation of their written work, both visually and through performance. Progress made by A Moment’s Peace and their future plans. Standing Strong was a really important project for A Moments Peace. Since then the group has grown considerably and have been involved with projects with the Tron and their latest project is a co-production with The Arches. Project, ‘Endurance’, is a large scale new production funded as part of the Commonwealth Games Cultural programme and will tell the stories of sportswomen who have competed in the Games since the 1930s. How has a Moment’s Peace helped vulnerable women? Theatre groups ran by A Moments Peace have given women the opportunity to meet and speak with others who are experiencing similar feelings. This will be a relief for them and also an opportunity to make new friends. Unemployment can make individuals feel down and depressed. Attending active groups such as this will be a distraction from their struggles. Building content for the presentations will help the women see with their own eyes how far they have come. It will also help to build skills and have confidence in their abilities. If you’ve been moved by this story please do just one thing – get in touch with Shona to learn more about investing in the Women’s Fund for Scotland.